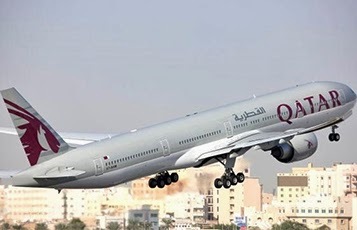 Effective April 1, 2014, Qatar Airways, the Doha-based five-star carrier, will upgrade its capacity on its Melbourne - Doha route, with a Boeing 777-300 aircraft. The introduction of the new long-range wide-body aircraft will result in a 30% capacity increase on the daily flights to Melbourne, which translates to 76 more seats per day. Qatar Airways also flies daily to Perth in Western Australia. With seven route launches already set to join the current network of 136 destinations in 2014, passengers will have numerous options when connecting through the airline’s hub in Doha, Qatar. Qatar Airways’ network is steadily increasing with new and exciting routes, such as Larnaca and Edinburgh both scheduled to launch soon, bringing the total number of destinations in Europe to 32. Commencing May 15, Qatar Airways will be offering an all Business Class flight from Doha to London Heathrow. The A319 will accommodate 40 Business Class passengers throughout the aircraft and will be the sixth daily flight from Doha to London. Business travellers will be able to take advantage of the award-winning Premium Lounge in London Heathrow and Premium Terminal at Doha International Airport. All flights on the Doha – Melbourne route will be operated with a modern Boeing 777-300, featuring a two-class configuration, with up to 42 seats in Business Class and up to 293 seats in Economy Class. The aircraft offers seatback TV screens providing passengers with the next generation interactive on-board entertainment system and a choice of more than 1,000 audio and video on-demand options. Qatar Airways has seen rapid growth in just 17 years of operations, currently flying a modern fleet of 131 aircraft to 136 key business and leisure destinations across Europe, the Middle East, Africa, Asia Pacific and the Americas.